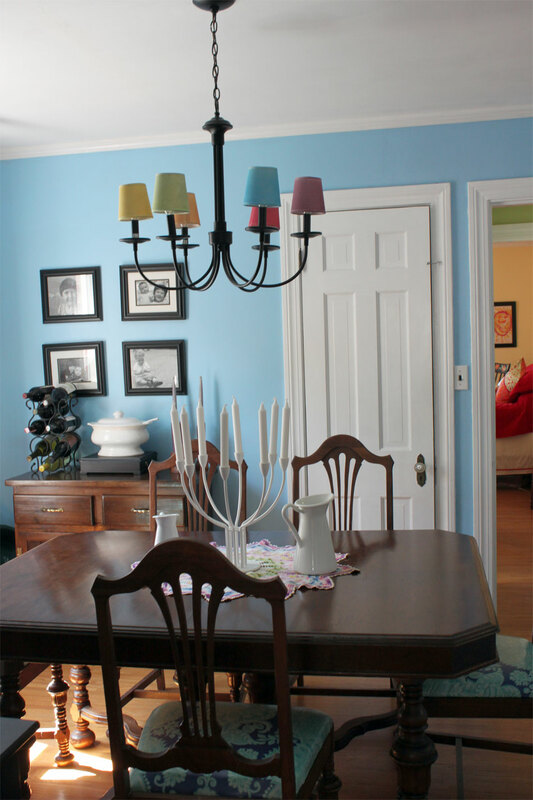 My husband (a good guy, let me state for the record) finally got to the point on his honey-do list that he put up our new dining room light fixture and I got to see my new painted shades in action. I couldn’t get just the right representative photo of them so I snapped them from all angles. 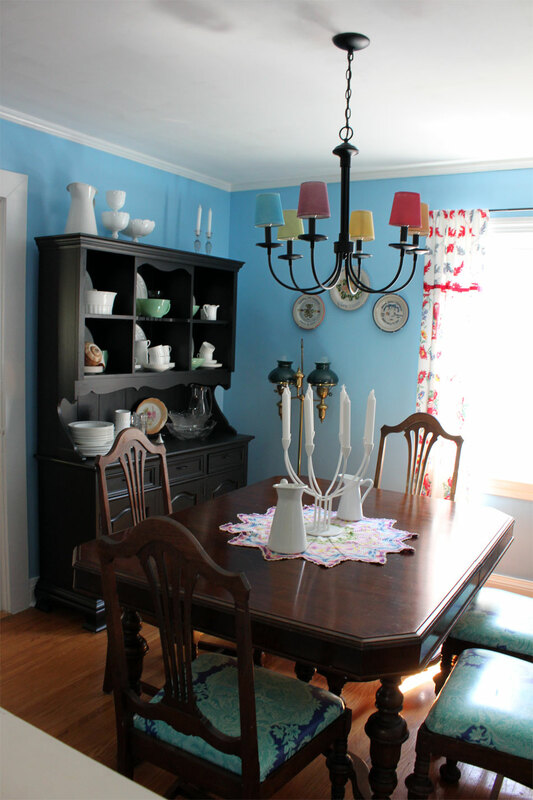 The matte black of the fixture matches my painted hutch. When I read in magazines about the “soothing” effect of neutral colors I always get confused. Neutral colors make me itch! I love color, and I love my new rainbow shades too. 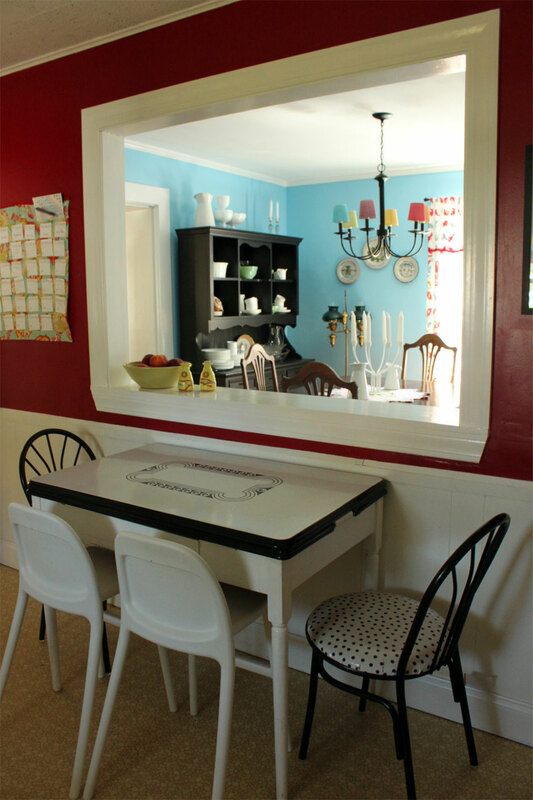 Here is the view from the kitchen, a big change from where we started. It is fun to watch our house become more and more ours as we continue to live in it and make little tweaks to make us happy. Not much time for craftiness around here the last couple weeks. We’ve had good times with out-of-town guests, not such good times with the appliance repairman, and now we’re dealing with a leaky basement. Life does come in seasons, doesn’t it? 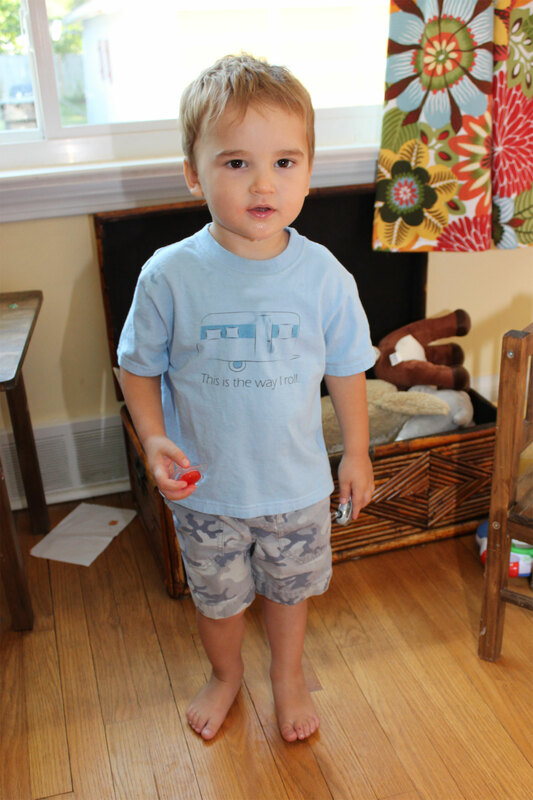 But I’ve been enjoying my children in the camper shirts I designed and bought from Cafe Press. Worth dripped water down the front of his right as I asked to take his photo, so that makes it more realistic, right? Somewhere just beyond the photo is the huge stack of books that has been building every day when the mailman brings more parcels. I’ve been ordering first grade supplies like crazy this last week. 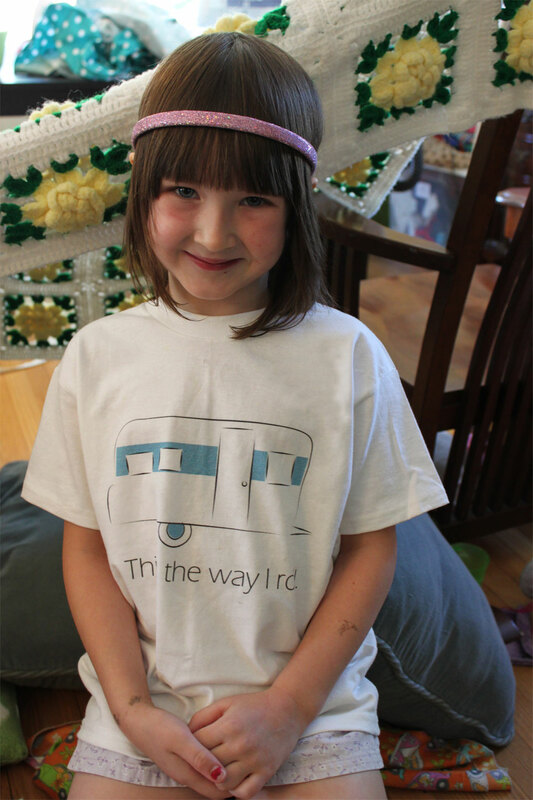 I can’t remember if I’ve mentioned it on the blog, but we decided to continue to homeschool. We applied to and were accepted into a public school program we felt good about, but we decided that homeschooling just works best for our family. We aren’t anti-school and we aren’t really anti-any of the other things that many people try to avoid by homeschooling–we’re just really in favor of our comparatively relaxed, family-centered life and we didn’t want to give it up. I’m looking forward to the start of school like a kid myself, and Dorothy and I play a game where she sneaks off and pours over the new books that are coming in, and I pretend to be mad because she’s not supposed to see them until school starts. 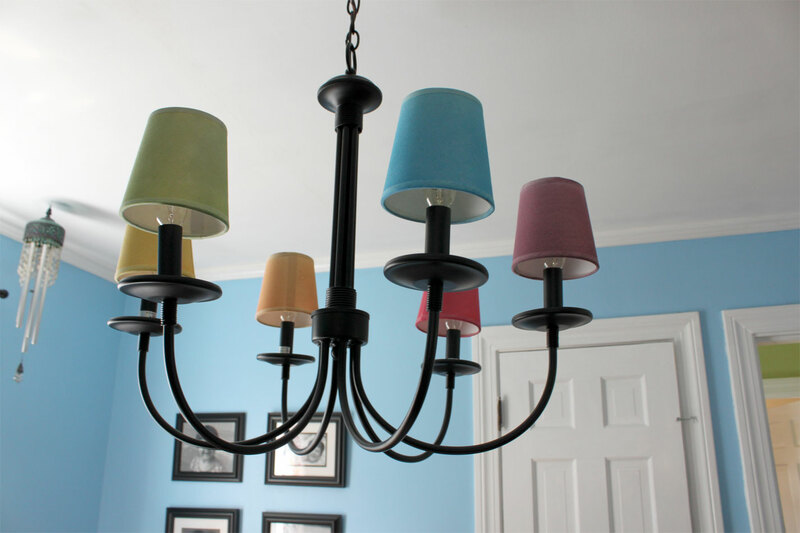 The only crafty thing I’ve done recently is these lamp shades. 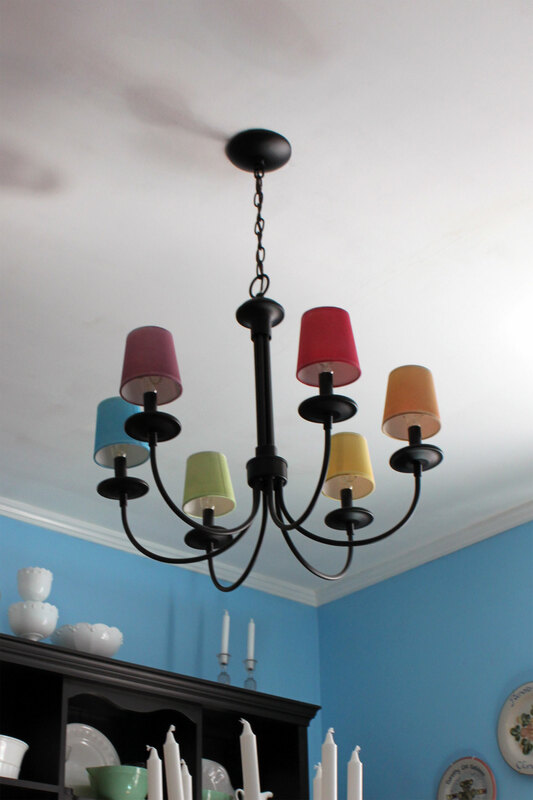 We just purchased a new fixture for our dining room but weren’t pleased with the shades available for the lights. (Ecru anyone? Or do you prefer off-white? 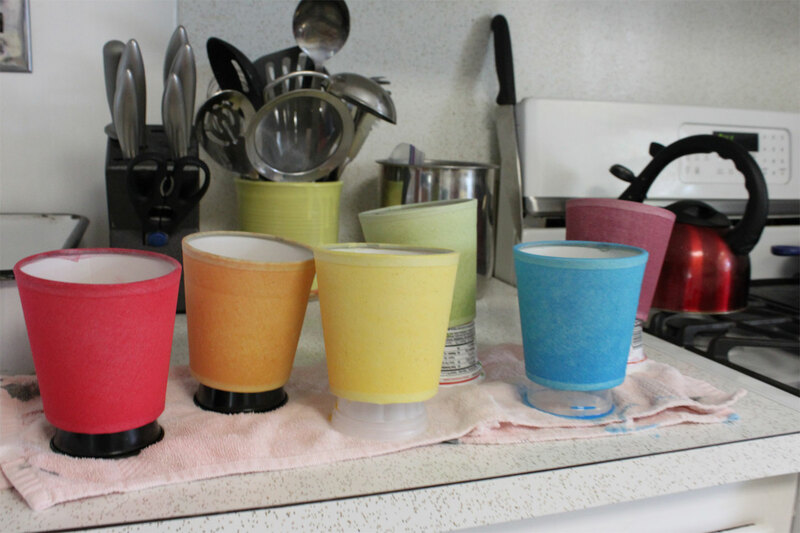 Not in my house…) I sponged watered-down crafts paint onto the bland shades and now they are beautiful and colorful and go with my house. I’m just waiting on my hubby and father-in-law to install the thing so I can pop the shades on and post a picture of the final product.